Whether you’re planning a handmade holiday or shopping for ethical and fair trade gifts this year, it’s a shame to put so much thought into the present only to wrap it up in less-then-eco-friendly packaging! Conventional wrapping paper isn’t so hot for the environment. The paper often comes from virgin forests, it uses high impact dyes that pollute waterways, and once the gift is unwrapped, that paper is headed for the recycle bin or even the landfill. Not so jolly, right? Luckily, you don’t have to buy rolls of unsustainable wrapping paper! 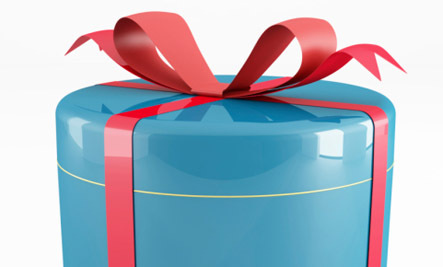 Instead, check out some of these giftwrap ideas that are as sustainable as they are fun! Furoshiki is the Japanese gift wrap style that uses fabric rather than paper. The joy of a furoshiki, as with all of these reusable giftwaps, is that the wrapping becomes part of the present. Traditional furoshiki can vary in size, and they can be quite expensive, but you can really use any large piece of square fabric with furoshiki techniques. Organic cotton flour sacks work well and are easy to come by, or you could use a square, silk scarf or even a large napkin or dish towel that you find at the thrift store. 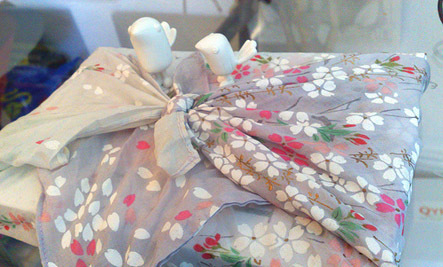 Depending on what you’re wrapping, there are different methods for furoshiki, but the video above details some of the most basic wrapping techniques. Glass Mason jars are endlessly handy! Your giftee can use her empty mason jar to store knickknacks or bulk food. You can use it as a water glass or a vase. It’s a gift wrap option that’s definitely not heading to the landfill. There are lots of gifts that you can make right inside of a Mason jar, or you can use it to wrap store-bought gifts. 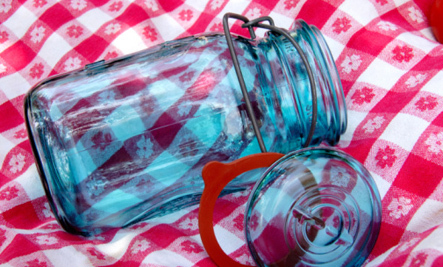 Small clothing or accessories like scarves or t-shirts will fit into pint- or quart-sized Mason jars. You can also use smaller half-pint Mason jars to gift more delicate things like jewelry and accessories. If you want to keep the present inside a mystery, just line the jar with a pretty piece of fabric. I don’t know about you guys, but I have a stash of those paper gift bags that grows every holiday. I like that you can use them over and over, and friends often save theirs for me, because they know that I reuse them. The trouble with those paper bags is that, although they’re reusable, they’re not terribly durable. That’s where fabric comes in! Fabric gift bags have a much longer lifespan than their paper cousins, and they’re useful to your giftee in between the holidays. They can use their fabric gift bag as a little tote, or to store delicate items like jewelry. When the holidays come around, you can toss a fabric gift bag in the wash and use it to wrap gifts once again! 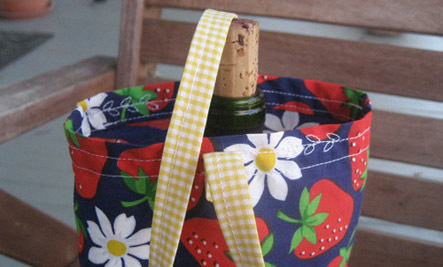 It’s easy as pie to sew up your own fabric gift bags, or you can find pre-made ones. My favorite place to look for finished fabric gift bags is on Etsy. You can find pretty metal tins in all shapes and sizes, and they’re great for gifting small presents like jewelry and even larger items like clothing. Just tie the tin up with a pretty bow, and you’re ready to put it under the tree! After the holiday is over, tins are great for storing and organizing. My mother-in-law gave me a gift in a 6″ tall square yellow tin over 5 years ago. I have no idea what present was inside of it, but I’ve been using the tin itself as an office organizer for my pens and pencils ever since, and I think of her every time I glance over at it. That’s the thing I love most about alternative giftwrap – it has heart, and it’s often memorable. Like decorative tins, gift baskets are another giftwrap option that are great for storage when the holidays are over. 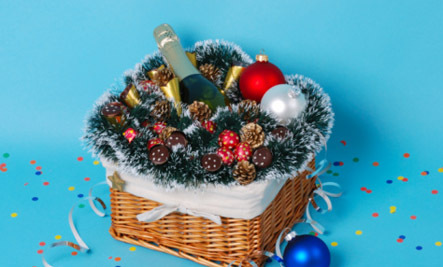 When you picture a gift basket, you probably imagine stuffing the bottom with tissue paper, layering in hoaky food gifts, and wrapping the whole affair with cellophane, but you can make a gift basket that’s much more modern than that! Line your basket with pretty fabric and arrange the gift inside. You can leave the whole thing open for a more minimalist look, or obscure the gifts with natural materials like pine cones and branches. I bet that there are other reusable wrapping ideas that I haven’t even thought of yet! What are you doing this year to keep your giftwrap as green as the presents inside? I like the tins and baskets ideas, unless you fill them with all sorts of plastic-wrapped items. Then it sort of defeats the purpose, doesn't it? Thanks for these ideas. I especially appreciated the instructional video on Furoshiki.